Buying a first home is a significant moment in any person’s life. You’ll likely be living there for a while so it’s important to know what your life will look like for the next five years. Don’t worry, you don’t have to have every element planned to a schedule, but there are some important elements to consider, that will ensure you get the best out of your new home. If you’re a home chef who loves trying out new recipes and providing feasts for friends and family, you’ll want to check out the specifications of the kitchen. Ensure the appliances are large enough for your needs, that there’s ample bench space for food prep, and that the sink is deep enough for your liking. These things may seem small, but they’ll make a world of difference when the time comes to host your first dinner party in your new home. What kind of lifestyle plans do you have for the next few years? If you want to get fit but travelling to the gym every morning chews up precious time in your schedule, then look for an apartment in a building with an on-site gym. If you want to get out in the garden more, but can’t afford the apartments with ground floor terraces then seek out apartment developments with communal rooftop vegetable patches. Love hosting big dinner parties? Choose an apartment with access to shared facilities such as a dining room and entertaining area. Are you planning on starting a family soon? Or perhaps you want to offset your mortgage by sharing your home with a housemate. If so, think about purchasing an apartment with two bedrooms. This is equally important if you plan to have friends or family stay over regularly. Buy a folding sofa bed and your spare bedroom can function as a study the rest of the time. If you’re a light sleeper and wake up at the slightest noise, it’s worth checking out the way the apartment is configured. 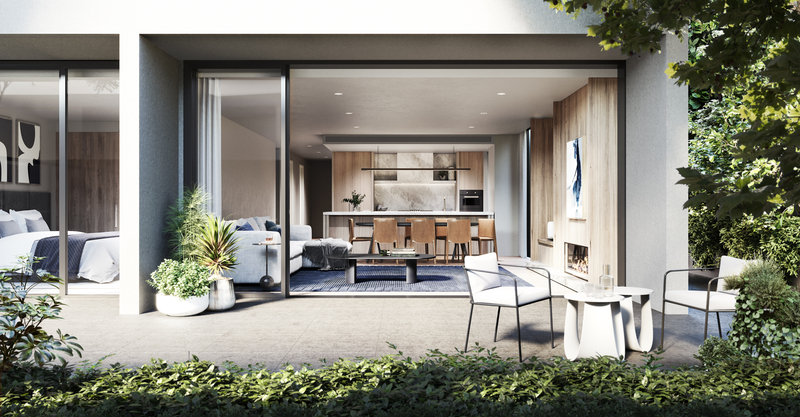 Most savvy developers plan the apartments so that bedrooms are as far away from noisy living areas as possible, but sometimes due to architectural elements or placement within the building, this isn’t always possible. The best apartments have built-in wardrobes on the connecting wall which act as a sound buffer. Lastly, consider your storage needs. If you can only afford a small home, then plenty of concealed storage inside your apartment and a storage cage in the basement are a useful bonus. Many apartment developments also have on-site bike storage, so you won’t have to keep yours in your home. Want to know more about buying your first home? Read this article.